JA García-Avilés, M Carvajal Prieto, F Arias Robles (2018): “Implementation of innovation in Spanish digital media: analysis of journalists’ perceptions”. Revista Latina de Comunicación Social, 73, pp. 369 to 384. Introduction. The media industry is facing the emergence of technologies and disruptive platforms that challenge its survival in an environment where audiences, production and business models constantly change. There is a consensus that innovation is a key resource to overcome this uncertainty. This article analyses the origin, development and implementation of innovation in digital news media from the journalists’ point of view. Methods. Our research builds upon the groundwork of 26 semi-structured interviews carried out in 2016 with professional journalists from a sample of innovative media organisations. Results. The results reveal journalists’ perceptions on the concept of innovation, its implementation, typology of innovations and professional profiles. Journalists believe that innovation must be “new” and “successful”, that it responds to the desire to “experiment”, that it must provide “something different” to the organisation, and that it comes from the capacity to “anticipate challenges”. Technology plays a relevant and transversal role. Journalists also value procedural, cognitive and attitudinal competencies in the innovative practice. Conclusions. Professionals are a key source to identify the changes that have taken place in journalism, because their insights help us understand and delve into the areas of innovation that are usually left out from the academic perspective. 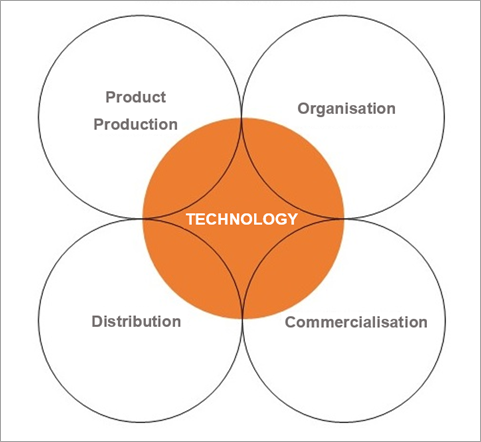 Media innovation; journalism practice; digital journalism; media organisation; business models; journalism. 1. Introduction. 2. Innovative digital news media in Spain. 3. Methods. 4. Results. 4.1. Origin and definition of innovation. 4.2. Typology of innovations. 4.3. Professional profiles and competencies. 4.4. Implementation of innovation. 5. Discussion and conclusions. 6. References. Innovation is essential for the survival of the media in a context marked by constant change in technology, audience behaviour, competition and business models. In the journalistic field, innovation can be understood as “the ability to react to changes in products, processes and services, through the use of creative competencies that enable the identification of problems and needs and their solution through something new that adds value to the organisation and its customers” (García-Avilés et al., 2016). In this sense, innovations are not reduced only to a new product, technology or content, but it can also be based on an original combination of ideas, processes or existing resources (Storsul and Krumsvik, 2013). The media need to act strategically to improve production, as well as their marketing strategy and organisational structures. As Lucy Küng (2015, p. 107) points out, “a solid strategic focus implies clear priorities that allocate resources intelligently and provide consistency and agility”. In recent years, research on journalism innovation has addressed a wide variety of areas, such as the impact of technologies (Spyridou et al., 2013; Dogruel, 2013), changes in production processes (Ranaivoson, Farchy and Gansemer, 2013; Westlund and Krumsvik, 2014), business models (Bruno and Nielsen, 2012) and the organisation of the newsroom (Weiss and Domingo, 2010). Authors such as Steensen (2009) have revealed how work culture, leadership in management, technological tools and the individual initiatives of journalists define the degree of innovation in a medium. Therefore, journalistic innovation requires leadership in management to integrate people and resources in the process of change, as well as to deal with “mutations” in areas related to technology, communication, and organisation (Boczkowski, 2004, p. 11). In the current media ecosystem, newsrooms are conceived as “learning communities” where innovative practices can be fostered (Porcu, 2017). For example, journalists and web developers can work together to achieve “a comprehensive, interconnected approach, and a new interpretive experience” (Peñafiel Sáiz, 2016, p. 176). Media companies with a flexible organisation facilitate the formation of multidisciplinary teams, with competencies and complementary capabilities that have an impact on the improvement of the quality of projects. The design of multidisciplinary teams, the horizontal organisation of workflow and fluid communication encourage innovation in the newsroom (García Santamaría et al., 2013). This research is based on the conviction that journalistic innovation should be analysed, in particular from the perspective of professionals, which is not always reflected in the academic work (Bleyen et al., 2014). In this sense, Weiss and Domingo (2010: 3) highlight the need for more field work in the newsroom because “the actors, dynamics and factors involved in the processes recognise the changing nature of journalism more than ever”. In Spain, the evolution of digital journalism ranges from the adaptation of traditional media content to the use of web-specific formats and professional practices. The majority of Spanish multimedia groups have implemented convergence strategies that have resulted in increased work, versatility and cost reduction (López and Pereira, 2010). Digital media distribute their content across multiple platforms and social networks, in order to increase viewership, extend their brand and interact with users (Túñez, 2012). However, innovative practices have been scarce and are taking too long to become consolidated in Spain. According the 2016 report of the Madrid Press Association, since the beginning of the crisis in 2008, more than 500 media companies have emerged in Spain and most of them are digital projects led by journalists (Asociación de la Prensa de Madrid, 2016). Paradoxically, this process has taken place in a period in which the economic crisis has hit strongly the news publishing industry, given that according to the same report, at least 14,000 jobs were lost in the sector during the same period. Structural changes have affected the operational capacity of the media and the work dynamics of journalists. 46% of journalists stated that their working conditions had been modified in a negative way since the crisis broke out; 28% said that they had been affected very negatively, due to business decisions that condition information policies to economic objectives; 17% stated that their situation had remained the same, and 9% stated that their situation had improved (Soengas, Rodríguez and Abuín, 2014, p. 117). The GICOV research group of the Miguel Hernández University of Elche developed the Journalistic Innovation Ranking in Spain, through the selection of the 25 most innovative journalistic initiatives in 2014 (De Lara et al., 2015). This work presents a matrix that quantifies the rate of innovation of journalistic initiatives in a particular market, identifying a total of 196 innovations in the 25 cases that composed the sample. The qualitative and quantitative analysis has allowed us to identify specific innovations in four areas of the journalistic activity: a) product or service provided; b) production and distribution processes; c) organisation of the medium; and d) marketing strategies (García Avilés et al., 2016). The results of this research (De Lara et al., 2015) indicate that in Spain innovation takes place at the periphery of the traditional media industry, thanks to the push of technology companies, the emergence of digital natives in specialised niches and the labs created in some media organisations. The most innovative initiatives include Fundación Civio, a public service institution that sponsors several websites dedicated to research and collaborative journalism; El Confidencial, a digital native medium founded in 2001; eldiario.es, an online news medium based on a system of partners who contribute financially to the project to be viable; and Vis-à-vis, an interactive magazine designed for iPads. From the business perspective, news media have undergone a progressive reduction of staff and increasingly focus their efforts on expanding their journalistic brand in the web. Thus, they aim to produce a more convergent and differentiated information product that can be complemented by and receive feedback from the contents published in other digital media (Manfredi, Rojas & Herranz, 2015, p. 72). Various digital native media use data-display formats, computer graphics, big data analysis and other innovative tools that allow them to generate content in a differentiated way and attract readers (García-Avilés, 2017). Local digital native media grant special prominence to citizens and offer innovative formulas for user-generated content (López, 2012). Proximity is the area that generates the most interest among entrepreneurial journalists, since at least three of every ten new media created by journalists from 2008 to 2014 are regional and local (Martínez, 2016). According to this author, thematic specialisation is a niche of new digital media: more than half of them are specialised in art, culture, sports, economy, business, international news, television, lifestyle, science, women, etc. These data reveal that the new media do not seek to compete with general-information mainstream media. Other entrepreneurial projects, crowdfunding formulas and business models have also emerged (Casero-Ripollés, 2013). Another area of interest is sports, where more and more journalists have launched their own communication businesses and projects to report on sports and its various aspects (Manfredi, Rojas and Herranz, 2015). Meanwhile, other media that stand out for their innovation in the production and distribution processes become consolidated (Sádaba, García Avilés and Martínez-Costa, 2016), which confirms that most digital natives have incorporated innovation in their DNA. This research work aims to achieve two main objectives: a) identify the elements and processes that characterise the work of journalists in the most innovative media; and b) analyse the most outstanding innovations according to the opinion of journalists and their contributions, with the aim of discovering patterns and relevant cases. 1. The analysis of journalistic innovation in Spain requires knowledge of the professional practices and perceptions of the professionals who carry out innovations in media newsrooms. 2. The identification of success stories and best innovation practices in journalism will contribute to strengthening the media sector in the Digital Society, both in traditional media and digital native media and start-ups. 3. The growth in the innovation level of the media in Spain will increase their competitiveness, because it allows them to differentiate themselves from the competition and increase customer loyalty. Qualitative methods have been used to achieve these objectives and test the research hypotheses. On the one hand, we selected a convenience sample composed of a total of 18 journalistic initiatives: nine included in the 2014 Journalistic Innovation Ranking in Spain, and nine initiatives which, in most cases, emerged after the publication of the ranking. The selected professionals belong to the following media: a) those included in the 2014 Ranking: El Confidencial, eldiario.es, Fundación Civio, Vis-à-Vis, Yorokobu, Jot Down, Lab RTVE, El Extrarradio and Mongolia; and b) media not included in the 2014 Ranking: El Mundo, Prisa Radio, Vice España, El Español, Quonda, Bottup, El Desmarque, The Spain Report and Atresmedia. The sample selection reflects a range of media with different origins and characteristics (digital natives, print-based media and audiovisual media, niche-based journalistic initiatives and innovation labs). All media were selected for their commitment to innovation, identified through the analysis of professional reports, searches in specialised media and knowledge of the market. During the fieldwork, from January to October 2016, face to face semi-structured interviews were conducted with each of the 26 professionals selected from the sample of media companies. Each interview, with an average duration of 45 minutes, was transcribed and encoded. The questionnaire, consisting of an average of 13 open-ended questions, explored innovation actions implemented in respondents’ media, professional profiles in their newsrooms, work processes, factors that drive or slow down innovations, and respondents’ perspective on the sector’s situation (see annex). The analysis of the professional perspective combines the importance of individual and collective actions by using a qualitative method that allows us to explore in depth the aspects detected in those areas where innovation takes place (Habann, 2008). We are aware of the methodological limitations in assessing certain areas such as, for example, the organisation area of each media, their income avenues and aspects related to the launching of products, which depend on the information supplied by respondents and the data media managers authorise us to use. However, the study of the professional perspective on innovation in journalism sheds light on the drivers of the changes in journalistic organisations and the processes that lead to the dissemination of innovations. Generic definitions of the concept of innovation abound among interviewees. Most of them verbalise a series of key notions that pivot around five essential concepts. For a journalism initiative to be considered innovative, it has to be new, different from what already exists, it should experiment with the creative possibilities and resources, anticipate competition and ultimately achieve a successful outcome. Based on the analysed interviews, these five elements make up what we call the conceptualisation of journalistic innovation and which we break down below. Several interviewees equate innovation with “what’s new, novel”. They point out that it consists of betting on products or formats that take risks and “break with what is established”, as stated by a data journalist. They also emphasise the idea of “offering something different from what already exists”. The founder of El Desmarque believes that “innovation is based on the idea that we have to be different at all costs. It is a long-term method for survival and improvement of brand values.” The social networks director of El Confidencial believes that innovation is “doing things that others do not do or doing what others do but in a completely different way”. Several respondents also stress the importance of “trial and error”, which leads a medium to innovate, so “experimenting with a wide variety of different ideas is crucial,” says one of the interviewed journalists. If professionals frequently experiment, it is clear that many of the new concepts will fail. And these failures are desirable because they allow teams to quickly eliminate those options that do not work and focus on viable alternatives. It is the “fail early and fail cheap” principle that some media have assumed in their development strategy. As stated by the Director of the RTVE Lab: “I get paid to fail and to learn from those failures, because experience is an essential part of our work”. The person responsible for new narratives in El Mundo says that “a medium is innovative when it devotes an important part of its resources to experimentation, to rehearse and produce new narratives”. Some respondents highlight that innovation comes from practice and is derived from specific circumstances and the resources provided by directors, through flexible structures. An interviewee maintains that innovation implies the ability to “respond to the opportunities and threats of the market, to anticipate to competitors, identify opportunities and risks”. In this way, by innovating a product or service, the company manages to anticipate competition, and this allows it to get some kind of benefit, whether tangible or intangible. There is a widespread consensus among journalists that for a project to be innovative it must be successful; i.e. it must entail an improvement for the medium, in terms of audience ratings, greater prestige or the reinforcement of the brand, increase in revenue or market share. 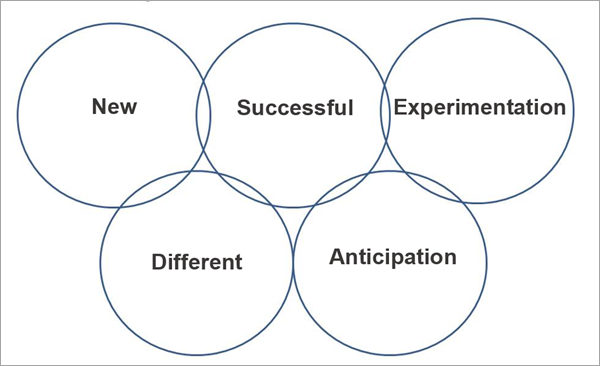 According to the interviewees, journalistic innovation is developed in four areas (Figure 2). The most prominent one is Products and Formats (12 mentions), followed by distribution (9), organisation of the medium (4) and finally, commercialisation or marketing and business models (3). Innovation in tools and technologies, mentioned by seven professionals, is considered a transversal field, because it is present in the four remaining areas, since any innovation requires a specific technology to be implemented. Therefore, technology is often essential. For example, the RTVE Lab proposes that all projects should have 30% of innovative technology that has never been used before, such as applications or programming languages, and in addition to using free tools, it should develop other tools that prove useful for work in the newsroom. The perspectives of professionals offer valuable contributions on the practice of innovation in journalism and its implementation in the newsroom. 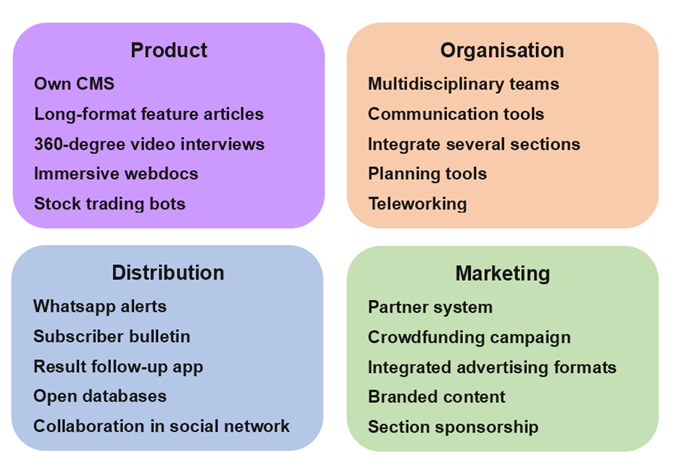 We detected four areas where journalistic innovation is developed, which allow us to establish a basic classification of innovations: production, content distribution, organisation of the medium and marketing (Figure 3). Specific objectives are identified in each of these areas are of innovation: content production and innovative formats, content distribution channels, innovation in processes and organisational systems and, finally, revenue avenues and the configuration of the business model. In the area of product and production numerous innovations were detected, such as the implementation of the medium’s own content management system (CMS) that is scalable and exportable to other companies; the production of long-format feature articles that increase time spent on the website; 360-degree video interviews to election candidates; the production of webdocs that incorporate immersive narrative and data journalism techniques; and the creation of bots that automatically inform users about stock quotes. Work on innovative products requires rigorous procedures. For example, Fundación Civio develops various journalistic projects focused on transparency and research. Its project manager, Eva Belmonte, highlights the scrupulous methodological treatment of data. This allows the foundation to develop projects based on the systematic analysis of sources such as the Official State Gazette. For its part, El Español created a specific application to visualise large amounts of data on Spanish cities before the elections. As one journalist from this medium pointed out, “we must manage make data speak and serve to tell good stories”. In the area of distribution, there are outstanding initiatives such as the launch of a WhatsApp channel offering information alerts to users; the development of attractive newsletters for subscribers; the creation of a news app that monitors election results; the development of open-access research databases; and in one medium, the collaboration of all journalists in distribution across social networks to reach the greatest number of users. In the field of organisation of the medium or enterprise, several interviewees mentioned the formation of multidisciplinary teams of journalists and technicians to develop projects that will feedback on each other; the use of tools that facilitate internal communication among editors and reporters, and improve teamwork; simultaneous content generation, integrating several professionals from different sections; use of planning tools that coordinate professionals’ tasks at all times; and the implementation of teleworking, with decentralised offices that journalists to work from anywhere. Innovation understood as a process assumes numerous structural and practical factors derived from the work of professionals, their inputs and contributions in different areas of productive activity. In the innovation labs created by some media (El Confidencial and RTVE), journalists, technicians and developers jointly develop projects, increasing synergies, communication and the generation of ideas in a collaborative way. Journalists working in innovative environments (through design thinking, experimentation and interdisciplinary projects) are more willing to take risks. In the media newsrooms, physical space becomes less important, to the point that some media use “virtual newsrooms”. We should not forget that some initiatives have a business model based on disparate work, thanks to technologies that transcend physical boundaries and enable cost savings, while allowing greater efficiency in job performance. With regards to marketing, innovations include the consolidation of a partners system that, upon a fee payment, ensure the sustainability of the medium; a crowdfunding campaign, with which a digital native medium raised 3.6 million euros in two months; the creation of advertising formats integrated natively in the design of the information product; a branded content strategy to include content in an integrated way; and the sponsorship of a medium’s content sections by advertisers and brands. A close relationship with customers is key for commercial innovation. Several interviewees agree that the partners system of eldiario.es is one of the most important commercial innovations. This partners-based model works well because, according to its deputy director, “people do not pay to read the news or break a paywall, but to become an accomplice of the medium and do journalism with social values”. Although the main revenue route of eldiario.es is still advertising, this system allows greater editorial independence: none of the advertisers provides as much money as the whole of the partners. Another success story is El Español, which raised 3.6 million euros through a crowdfunding campaign, which broke the world’s record. Some media organisations also used the donations of members and crowdfunding for certain projects or experimented with unusual business strategies. For example, the editors of Mongolia magazine, as an editorial principle, avoid advertising and use routes such as book sales, merchandising and musical performances. Innovative advertising formats have also been detected. Vis-à-Vis magazine maintains a very close relationship with advertisers to develop ad hoc formats. This system has enabled them to efficiently sell advertising space on tablets. As part of its business model, Vis-à-Vis offers services to private companies, who want to launch their products in tablets for their workers, as well as branded content. Interviewees agree on the importance of editors having technological and audiovisual culture. They agree teams should be integrated by veteran and young journalists with multipurpose profiles, which also implies transversal professionals with the ability to learn. The common denominator is close to the following formula: technological profiles and teamwork to achieve an innovative product that puts the audience first. Because, according to the director of RTVE Lab, “when ideas receive different influences from the outset, they become big ideas”. Most media companies choose to enhance teamwork, without forgetting synchronisation between the different areas of work. These media want professionals specialised in each area, with autonomy for decision-making. They prefer not to abuse of meetings of traditional contents because they consider that they can subtract productivity. Contents are designed by taking into account the broadcasting channeland the audience, which affects the dynamics of teams. Media companies usually have small and medium-sized teams (of between three and 30 people), and also work with external collaborators. Specialised and technological transversal profiles predominate among professionals. The implementation of technology is also key in the organisation. The deputy director of Eldiario.es highlights that technology is integrated into the information flow in the newsroom through tools such as Telegram, which facilitate decision making, and Slack, which makes teamwork more flexible and avoids overcrowded meetings. The decision-making process in many newsrooms is essentially horizontal. Decisions are made with hierarchy, but they facilitate dialogue and interaction. In this sense, an exponent of flexibility is Mongolia magazine, where the agenda setting is done by a team. According to the innovation director of El Confidencial, each section is assigned to one person and decision-making processes privilege flexibility. The co-founder of Vis-à-Vis magazine stresses the importance of working together with the design department: “the point is not that all people are experts in design but have to know the basics to understand what things work and do not work”. For the person responsible for projects in Fundación Civio, multidisciplinary work “facilitates the approach to other points of view”. Note: Competencies mentioned by at least three interviewees are in bold. Competencies refer to what a person needs to respond to problems that will be faced in a particular area. The use of competencies refers to processes that consist of different actions: analysis of the situation under study in all its complexity, problem identification, selection of relevant information for the resolution of problems, evaluation of the different options, and application of a scheme of action in a timely manner, integrating concepts, procedures and attitudes that make up the competence. 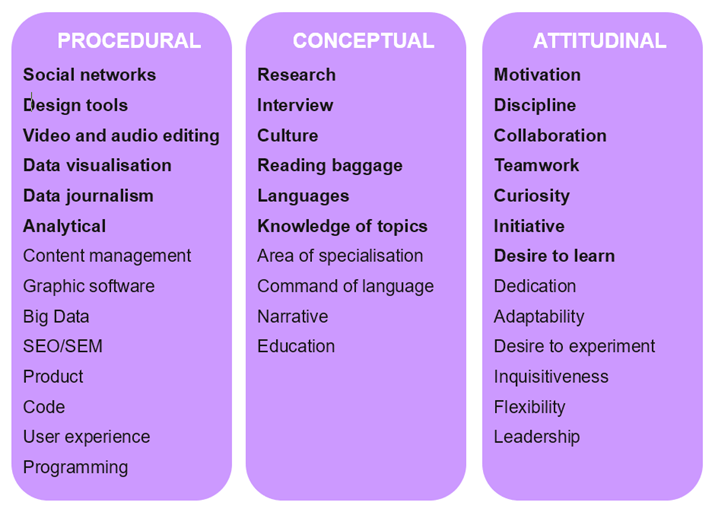 Respondents highlighted a series of competencies, related to the acquisition of specific contents and skills, which are essential for those professionals who want to innovate (Figure 4). Such competencies can be divided into three groups: a) procedural, oriented to the command of tools and job skills; b) conceptual, related to the acquisition of knowledge; and c) attitudinal, which encourage specific habits and qualities in the workplace. Procedural competencies include the use of tools of journalistic design, the management of social networks and the use of networks as a distribution channel, the use of graphics applications, as well as video and audio editing programs. Data visualisation tools and data journalism techniques also stand out. To a lesser extent, respondents mention the convenience of having knowledge of coding and programming, product, big data, web analytics, as well as SEO and SEM techniques. In relation to the conceptual competencies, respondents underline the need to dominate research methods and use of sources, to know how to do interviews, knowledge of languages, having a wide cultural background and knowledge of the issues they cover. Some recommend a certain level of specialisation, mastery of the language, knowledge of how to narrate and update their education consistently. Attitudinal competencies are especially useful for professional performance because they relate directly with the know-how in certain situations. Respondents indicate that this type of competencies encourage creativity and productivity, and often translate into greater personal satisfaction in the workplace. Motivation and enthusiasm are considered determining competencies, according to professionals, along with a collaborative attitude, discipline and teamwork. Curiosity and desire to learn are also underlined by a significant number of interviewees. Less cited competencies include dedication, the ability to experiment, leadership, flexibility and adaptability. The contributions of the interviewed journalists allow us to identify a number of factors that drive innovation. These include the ability to invest and leadership in innovation in the newsroom; other factors favouring these processes are the motivation of workers, the implementation of “trial and error” practices in the development of projects, as well as the promotion of creativity in professionals. Interviewees also identify the results that are obtained when the journalistic company innovates, such as increase in audience, improvement of production processes, strengthening of the brand, the satisfaction of users with products or services and an increase in revenue. Respondents also allude to the main obstacles that hinder or slow down the implementation of innovations. On the one hand, they underline the lack of resources that the company allocates to innovation and also the absence of a strong leadership to set out priorities and communicate objectives. As one journalist points out, “there is no clear strategy to plan and achieve specific goals”. They also mention the lack of motivation in staff due to adverse working conditions, directors’ lack of action and, in some cases, the “fear to innovate” and going against the current. A journalist from a digital native medium underlines that innovation occurs only “in isolated cases, not as a structural policy set by the management”, and that “it is often a matter of public relations to promote the medium”. To overcome resistance to change, media companies should lose fear of failure and banish their obsession with short-term profitability. “Failures help and inform, you learn in the process of creation of these projects and you apply it to other products. The idea is to fail fast and fail cheap”, says the director of El Confidencial Lab. The perceptions of workers and managers stress the importance of the individual initiative of the “agents of change”, together with the effectiveness of the leadership and the implementation of interdisciplinary teams, composed of journalists and technicians. According to some interviewees, most innovative media promote interaction between the various departments and sections, as well as workflows that promote an innovative culture in the organisation. As one journalist from El Confidencial points out, “innovation must be transversal across the company, where everyone gets involved, and as many people as possible, from all levels, get involved”. Several respondents consider that it is a process that most often arises from management, but that it should be implemented “bottom-up”, that is, from the base of the newsroom. The analysis of the results reveals that professionals are a crucial source to understand the changes in the journalistic sector, because their view helps us to delve into areas of innovation that tend to be left out of the academic perspective. In the current ecosystem, where the economic structure of traditional media has been weakened and digital native media are not achieving the expected strength, it is convenient to explore the perception of professionals on the most innovative initiatives in the journalism sector. Professionals emphasise on the first place that audiences change as much or more than technologies and that they constitute the focus of innovation processes. According to evolving needs and preferences of users, the media have to adapt and develop new content, distribution channels, business models and processes of interaction with the audience. Moreover, interviewees offer a conceptualisation of innovation that consists of five elements: the initiative to be introduced must be new, should be successful in its implementation, must respond to the desire to experiment, should contribute something different to the environment of reference and should come from the ability to anticipate the challenges and difficulties faced by the media sector. The analysis of the interviews reveals that this view emerges from the journalistic practice in the usual areas of business activity: products and formats, distribution, organisation of the medium and business models. For most of the interviewees, technology occupies a relevant role in all of these areas because it enables them to develop applications thanks to the use of programming languages or tools for common tasks in writing. Professionals’ responses provide valuable contributions on the practice of innovation in journalism and its implementation in the newsroom. They highlight the production of innovative contents and formats, the original use of information distribution channels, changes in organisational systems and processes and, finally, the search for revenue avenues, which respond to a new configuration of the business model. In addition, responses focus on the importance of editors having technological and audiovisual culture. Interviewees described the need to integrate teams with young and veteran journalists, with versatile and transversal profiles and learning abilities.Professionals also highlight a series of competencies that are essential in their profession: a) procedural, related to the command of tools, processes and technologies; b) cognitive, relating to the fundamental tasks of intellectual activity; and c) attitudinal, which refer to discipline, motivation, disposal, and collaborative ability to experiment. The results suggest that the media drive innovation mainly in so far as their managers are committed to implement strategies that allow expanding markets, consolidating the brand, attracting new audience niches, selecting interdisciplinary teams and increasing revenue avenues. This research presents a series of limitations due to the small size of the sample, which was selected through convenience sampling, which does not aim to be representative of the whole media sector in Spain. Thus, it would be convenient to expand the longitudinal frame of the study and deepen the scope of the innovations over an extended period, which would allow us to evaluate the results in a more complete manner. It is necessary to carry out more studies to delve into the journalistic innovations, their specific results in the companies that drive them, and their wider impact on society. Funded research. This article is a product of the research project “INNOVAPER: Innovation in journalism in Spain”, which has been funded by the Research Department of the Miguel Hernández University in a competitive call for proposals. Asociación de la Prensa de Madrid (2016): Informe Anual de la Profesión Periodística. Madrid: APM. Bleyen, V. A., Lindmark, S., Ranaivoson, H. y Ballon, P. (2014): “A typology of media innovations: Insights from an exploratory study”. The Journal of Media Innovations, 1(1), 28-51. Boczkowski, P. J. (2004): Digitizing the News: Innovation in Online Newspapers. Cambridge, Massachusetts: The MIT Press. Casero-Ripollés, A. (2013): “Periodismo emprendedor. Estrategias para incentivar el autoempleo periodístico como modelo de negocio”. Estudios sobre el mensaje periodístico, 19, 681-690. De-Lara-González, A.; Arias-Robles, F.; Carvajal-Prieto, M. y García-Avilés, J. A. (2015): “Ranking de innovación periodística 2014 en España. Selección y análisis de 25 iniciativas”. El profesional de la información, 24(3): 235-245. Dogruel, L. (2013): Opening the Black Box. Conceptualizing of Media Innovation. En S. Storsul y A. H. Krumsvik (Eds.). Media Innovation. A Multidisciplinary Study of Change. Göteborg: Nordicom, 29-44. García-Avilés, J. A.; Carvajal-Prieto, M., De Lara-González, A., y Arias-Robles, F. (2016): “Developing an Index of Media Innovation in a National Market. The case of Spain”, Journalism Studies. Online first. 25-42. García-Avilés, J. A. (2017). “Identifying Innovation. How to grasp the chance of change -some lessons from Spain”? En Kaltenbrunner, A.; Kraus, D.; Karmasin; M. (eds.) Journalism Report V. Innovation and Transition. Viena: Facultas, pp. 35-48. García Santamaría, J. V., Clemente Fernández, M. D., y López Aboal, M. (2013): “La organización de las redacciones en los nuevos diarios digitales españoles y su relación con los nuevos modelos de negocio”. Textual and Visual Media, 6, 141-160. Habann, F. (2008): Towards a Methodological Foundation of Media Innovation Research. En C. D. Zotto y H. V.
Kranenburg (Eds.) Management and Innovation in the Media Industry. Cheltenham, UK: Edward Elgar, 67-86. Krumsvik, A. y Storsul, T. (eds.) (2013). Media Innovations: A Multidisciplinary Study of Change. Göteborg: Nordicom. Küng, L. (2015): Innovators in Digital News. London: Reuters Institute for the Study of Journalism y I. B. Tauris. López García, X. y Pereira Fariña, X. (Eds.) (2010): Convergencia digital. Reconfiguración de los medios de Comunicación en España. Santiago de Compostela. Servicio de Publicaciones e Intercambio Científico de la Universidad de Santiago. Peñafiel Saiz, Carmen (2016): Reinvención del periodismo en el ecosistema digital y narrativas transmedia. adComunica. Revista Científica de Estrategias, Tendencias e Innovación en Comunicación, 12, 163-182. Ranaivoson, H.; Farchy, J. y Gansemer, M. (2013): “Differentiated strategies for digital innovation on television: Traditional channels vs. new entrants”. Observatorio (OBS*), 7 (4). Sábada, C., García-Avilés, J. A.; Martínez-Costa, M. P. (Coords.) (2016): Innovación y desarrollo de los cibermedios en España. Pamplona: Eunsa. Spyridou, L.-P.; Matsiola, M.; Veglis, A.; Kalliris, G., y Dimoulas, C. (2013): “Journalism in a state of flux: Journalists as agents of technology innovation and emerging news practices”. International Communication Gazette, 75(1), 76-98. Steensen, S. (2009): “What's stopping them? Towards a grounded theory of innovation in online journalism”. Journalism Studies, 10(6), 821-836. Storsul, T. y Krumsvik, A. H. (2013): What is Media Innovation? En T. Storsul y A. H. Krumsvik (Eds.) Media Innovations. A Multidisciplinary Study of Change. Gothenburg: Nordicom, 13-26. Túñez López, M. (2012): “Los periódicos en las redes sociales: audiencias, contenido, interactividad y estrategias comerciales”. Estudios sobre el mensaje periodístico, 18(1), 221-239. Weiss, A. S. y Domingo, D. (2010): “Innovation processes in online newsrooms as actor-networks and communities of practice”. New Media and Society, 12(7), 1156-1171. Westlund, O.,y y Krumsvik, A. H. (2014): “Perceptions of Intra-Organizational Collaboration and Media Workers’ Interests in Media Innovations”. The Journal of Media Innovations, 1(2), 52-74. 1. How do you define innovation in journalism? In other words, what features should a medium, initiative or service have to be truly innovative? 2. Can you name a national or international medium that is particularly innovative? Explain why. 3. What are the main difficulties that journalists and entrepreneurs face to develop a medium and consolidate it? 4. Do you think that Spain has an underdeveloped entrepreneurial culture or offers fewer facilities compared with other countries? 5. What specific aspects of your media company do you consider are the most innovative in any of these areas: technology, organisation, distribution and production? 6. Can you describe the work system of your newsroom and the extent to what it breaks with traditional routines? 7. To what needs does your company respond? 8. Can you mention tools for content development/production, distribution, design that you consider to be innovative for journalism? 9. How is audience participation managed in your medium/newsroom? Please mention a success story. 10. What are the main business models of your medium or new media? Do they work? 11. What is the greatest or latest innovation introduced in your medium? 12. What new competencies are required from today’s journalists? 13. What advice would you give to a journalist who wishes to start a new business in the field of communication? Article received on 8 December 2017. Accepted on 9 February. Published on 17 February 2018.